Iranian leaders are threatening to restart the country's contested nuclear enrichment program in just a matter of days as the Trump administration and European allies scramble to address a range of flaws in the landmark nuclear accord ahead of a May deadline that could see the United States walk away from the accord, according to regional reports and administration insiders. The head of Iran's Atomic Energy Organization disclosed on Sunday that the Islamic Republic has maintained the ability to restart the full-scale enrichment of uranium—the key component in a nuclear weapon that was supposed to be removed from Iran as part of the nuclear agreement—in just four days. Ali Akbar Salehi, head of Iran's atomic work, claimed Iran could enrich uranium to 20 percent, which is more than enough to quickly reach the threshold to power a nuclear weapon, in just four days if the word is given by Iran's hardline ruling regime. The disclosure has roiled Trump administration insiders and nuclear experts who have been warning for months that Iran never fully disclosed the nature of its nuclear weapons work and progress as international leaders struggle to fix the deal by May, according to those who spoke to the Washington Free Beacon about the situation. The Trump administration is pushing European allies to agree to a range of new strictures that would constrain Iran's ongoing nuclear research, as well as its ballistic missile program, which has continued to progress unimpeded since the nuclear deal was locked in place. "If senior Islamic Republic officials issue an order to resume the 20% enrichment, we can do it in [the] Fordo [nuclear facility] within 4 days," Salehi was quoted as telling reporters on Sunday in Iran's state-controlled press. The comments are meant serve "as a warning" to the United States and other global powers, which Iran has accused of violating the accord by not implementing a series of economic concessions that would give Iran access billions in cash resources and business deals. "Iran can even show more extensive progress in other parts of its nuclear activities to go beyond the previous levels," Iran's state-controlled Fars News Agency reported Salehi as warning. 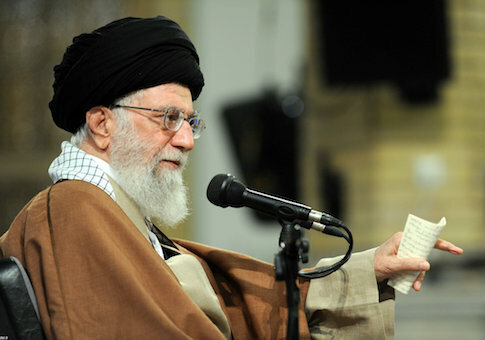 Iranian leaders have also claimed that it can take its nuclear enrichment activities even further than it did before the agreement restricted such activity. "We don’t have any problems technically," Behrouz Kamalvandi, another Iranian atomic official was quoted as saying last year. "We were moving normally in the past but if we want to soar up, we can ascend to go up the ladder and develop 100,000 SWUs [of enrichment capacity] in one and a half years." This would include revamping the Arak heavy water facility, which would provide Iran with a second, plutonium-based pathway to a nuclear weapon. Mark Dubowitz, a nuclear expert who has advised the White House and Congress on the Iran issue, told the Free Beacon that Iran's latest enrichment threats expose critical flaws in the Iran deal that the Trump administration is seeking to address. Iran's "threats confirm that the Iranian regime never gave up on its atomic weapon ambitions," said Dubowitz, CEO of the Foundation for Defense of Democracies, a Washington-based think-tank. The nuclear deal, also known as the Joint Comprehensive Plan of Action, or JCPOA, "merely hit the pause button temporarily on those aspects of Iran’s nuclear program that it had already perfected — and, as [Salehi's] threats underscore, could be easily restarted—while leaving Tehran with the time and space to develop technologies that it hadn't perfected such as advanced centrifuges and missiles," Dubowitz said. "His threats reveal what many deal skeptics have long argued: unless the JCPOA is fixed, Iran has pathways to dozens of nuclear-tipped missiles capable of striking U.S. forces, U.S. allies, and eventually the U.S. homeland." Trump administration insiders who spoke to the Free Beacon about the matter warned that Iran’s threats can be backed up with action should the Islamic Republic decide to abandon the deal and buck Trump. "This is exactly what President Trump means when he says the Iran deal is the worst agreement ever negotiated," said one Republican foreign policy adviser who is close to the White House. "The Obama administration gave away the store, literally sending Iran billions and billions of dollars, but the deal left Iran with the ability to reverse their concessions in a couple of days," the source said. "We gave away too much for too little, and every day the deal stays in place Iran gets more and more benefits from sanctions relief. No wonder the president is leaning toward getting us out." Michael Rubin, a former Pentagon adviser and expert on rogue regimes, noted that while international inspectors have had access to some of Iran’s nuclear sites, it has not been permitted to inspect secret sites, including underground facilities that could have continued to serve as a nuclear research hub for Iran since the deal was implemented. "This is just one more statement to show what a mirage the JCPOA was," Rubin said. "Iran built an underground facility under the nose of the IAEA, and Obama allowed them to keep it. The more we see the Iran nuclear deal, the more it seems about as effective as the deal to end Syria's chemical weapons." This entry was posted in National Security and tagged Iran, Iran Nuclear Deal. Bookmark the permalink.